David Mead talks with concert pianist Alexandra Dariescu, choreographer Jenna Lee and dancer Amy Drew about an innovative concert coming up at Milton Court at the Barbican on December 19th. ‘The Nutrcracker and I’, by Alexandra Dariescu is a classical music concert with a twist. 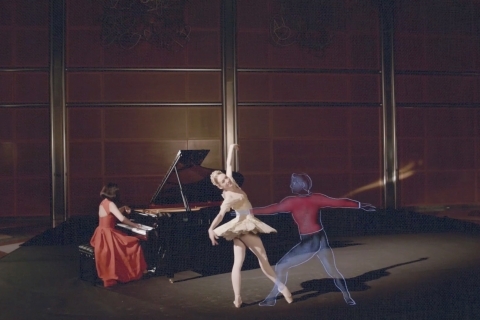 Alexandra will be at the grand piano as usual, but joining her on stage and bringing her story to life will be a live ballerina and digital animations. As the title suggests, ‘The Nutcracker and I’ by Alexandra Dariescu is very much her personal take on the much-loved tale. While it is The Nutcracker story, it’s told within her story, and her childhood dream of becoming a concert pianist. “In a way, I’m letting the audience in to my world,” she says. 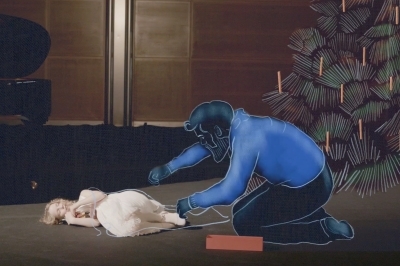 Putting ‘The Nutcracker and I’ on is not without its challenges. “Our technical rider at the beginning was huge; about 20 pages,” says Alexandra. “It’s not like the usual concert. We are coming with a projector, a gauze screen. We need rigging points. We do need quite a lot of time to set up, but we have tried to keep it to a minimum. Then there’s the nature of the piano. With most instruments, the player can move, turn and face the audience, engage with them. Alexandra feels that the piano is a very solitary instrument, though. “So, what we’ve done, is have piano take the role of Uncle Drosselmeyer, who comes up with the Nutcracker and all the magic. Everything is going to come out of the piano. That’s my medium for making it all happen.” How much she will be able to see from the piano, she doesn’t know yet. “I’ll find out two weeks prior to the premiere,” she says. Making the animations happen is Nick Hillel and the team at Yeast Culture, a film and digital media company based in Camden, London. The company embraces many disciplines and has work on many live performance projects, including, in dance, Akram Khan’s Desh. “I’d seen quite a bit of work from them in a few different productions and I absolutely fell in love with what they were doing. They were the first element in this,” says Alexandra. The music itself features 12 piano arrangements of Tchaikovsky numbers from the ballet by Mikhail Pletnev, Stepan Esipoff and Percy Grainger, plus three new arrangements by English National Ballet music director, Gavin Sutherland. All the favourites are there including the Dance of the Sugar Plum Fairy, Arabian Dance, Chinese Dance, Pas de Deux, and the Waltz of the Flowers. 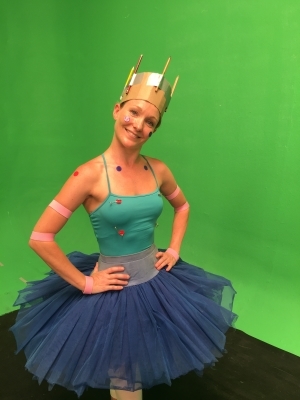 Another layer to the usual challenges of choreographing a new piece has been having to create around characters and digital sets still in the imaginations of the animators. “We had to have in our mind’s eye just where things would be. I’m looking forward to working with the animations for real, making sure we are very precise with our spacing, all of that kind of thing,” adds Amy. Alexandra, Jenna and Amy are all bubbling with anticipation as they look forward to December’s premiere. “The fact that I won’t see how it is really coming together until a few days before the show is odd, but I’m super excited,” says Jenna. “I think it’s something that will translate really well. I really hope it takes off,” adds Amy. 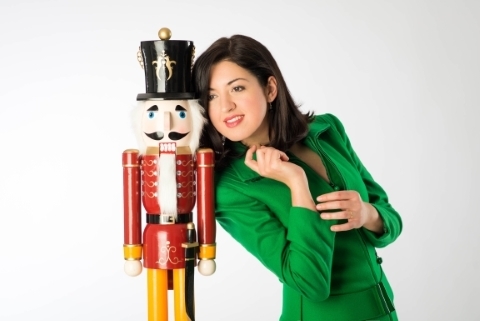 Part of the Guildhall School of Music & Drama’s Alumni Recital Series, ‘The Nutcracker and I’, by Alexandra Dariescu, has its world premiere on Tuesday 19 December at 6pm with another performance at 8pm, at Milton Court at London’s Barbican Centre. Click here for details. The premiere will be followed by performances in Moscow’s International Performing Arts Centre, the Stavanger International Chamber Music Festival in Norway and a tour to China.